Electric bikes are considered by many to be the perfect holiday gift. E-bikes are easy, convenient ways to get around. They’re not a disposable gift that gets used once or twice before collecting dust in the bottom of someone’s closet. When you enjoy a powered bike, you enjoy more of the world around you. More importantly, electric bikes are meant to be fun. And we’ve built our eBikes to be exactly that. No pedals? No problem. Sit back, relax and let the throttle do all the work — no sweating required. That’s part of the appeal of pedal-free electric bikes in our Swagcycle fleet. 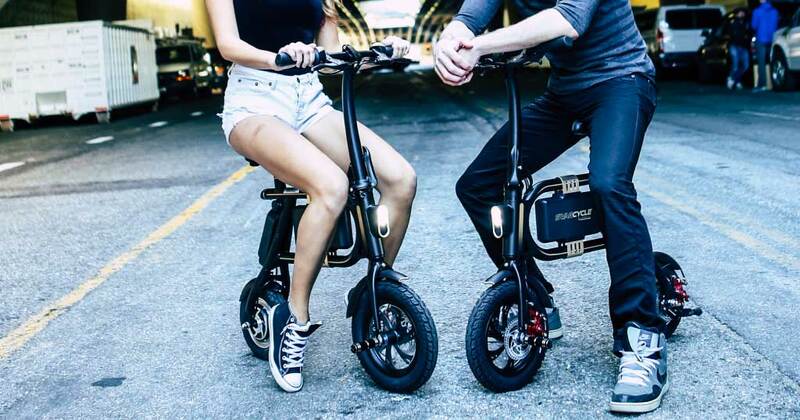 In that respect, the Swagcycle might seem more like a seated electric scooter. But we’ve built them to look like a bike and ride like a moped, only quieter — and a lot better. Our original, pedal-free electric bike, this is the electric cycle that started it all. The Swagcycle Classic continues to be on the top of holiday lists, even today. It’s a fun, compact and eco-friendly way to get around, whether you’re a young adventurer, college student or commuting adult. 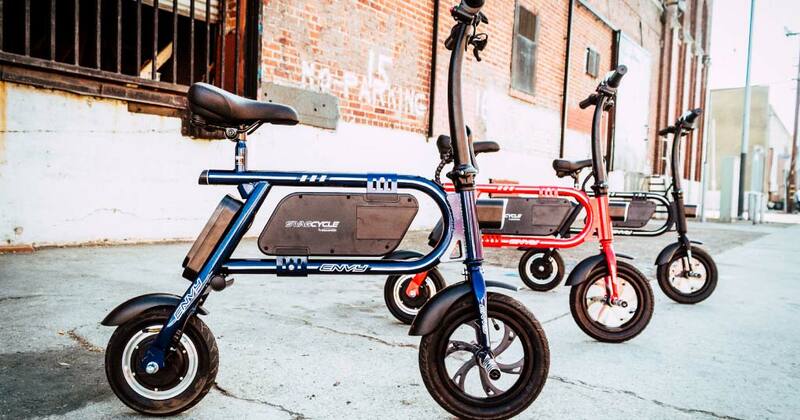 Rugged and robust, the Swagcycle Envy is a compact powerhouse with a durable steel frame. 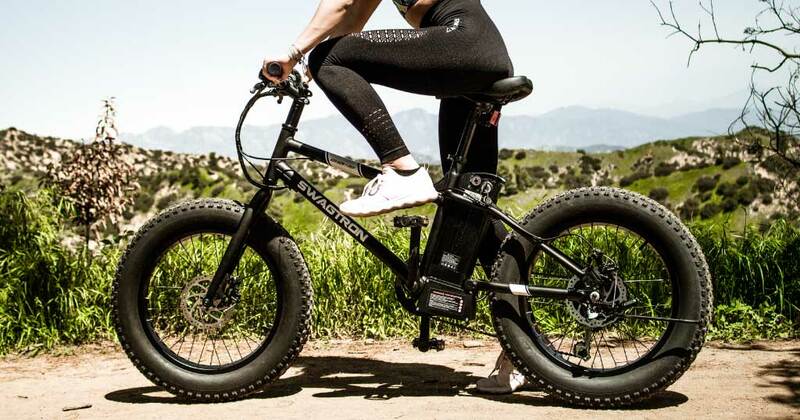 This electric bicycle allows you to groove up to 9 mph for a maximum range of up to 10 miles! For those riding at night, the Envy also comes with a low light headlight that automatically lights up at night, so you can ride with care, knowing that you can see and be seen. 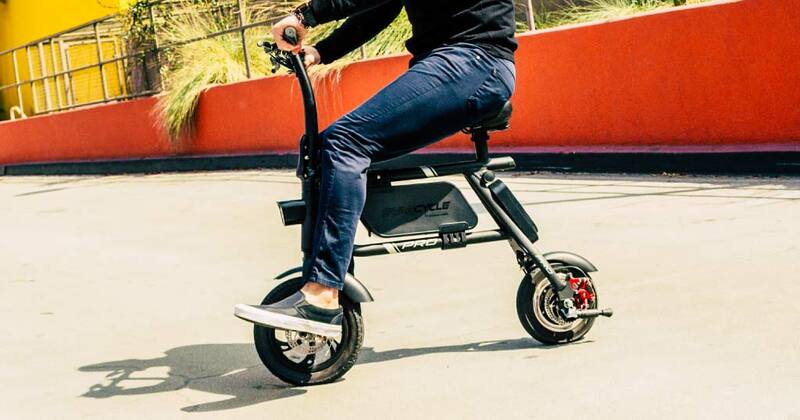 Smarter than your average bicycle, the SwagCycle Pro is a pedal-free, foldable electric bike designed to provide stylish convenience. Look good on your weekend adventure in the park, explore your city, or run short errands. Commuting to school or work? The Swagcycle Pro is the perfect last-mile solution to get you from the bus stop or train station to campus or your office with time to spare. The Pro features sturdy, air-filled rubber tires for better traction and shock absorbency for smoother rides over bumpy pavement. Download the SWAGCYCLE II app and unlock advanced features, monitor battery life, check speed and more. 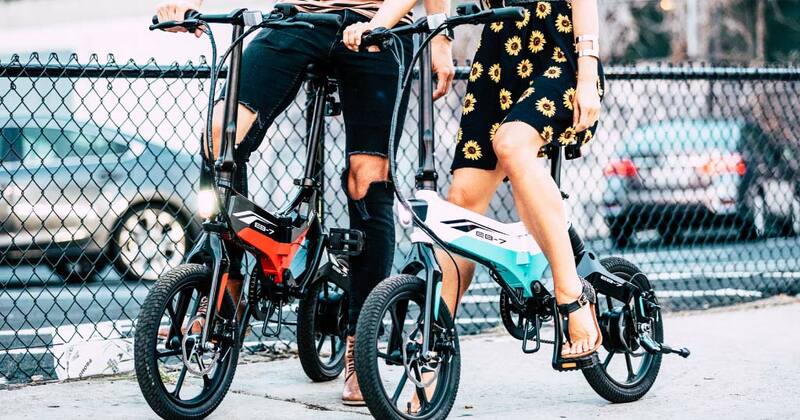 Our EB line of electric bikes is built more like a conventional bicycle, complete with drivetrain, pedals and the ability to control exactly how much physical effort you want to put into your ride. Want to push it to your limit? Switch to pedal-only mode and go all-in. Need a bit of help climbing those steep hills? Engage the power-assisted mode and get help from the motor. How much — or how little — you pedal is totally up to you. You’re in control. And that’s part of what makes our EB fleet perfect for riders of all skill levels. This state-of-the-art electric bike delivers a pedal-assisted commuting solution to riders of all ages. Go from bus stop to office with time to spare. Explore more of your city without breaking a sweat. Get from one end of campus to the other in record time. Travel farther, climb higher, and complete your commute in record time. The EB5 Pro is the answer to revamping your everyday commute, from major cities to the countryside. Reinforced with quality materials and a long-lasting battery, the Pro can take you just about anywhere you want to go. It’s packed with enough power to reach speeds of 15 mph and travel up to 15.5 miles on a single charge. But you’re not limited to going full throttle alone. Switch to pedal-only mode when you need to conserve battery or want to get an extra workout. Looks great. Rides even better. An environmentally friendly solution for getting around that’s built for adults and teens, the EB7 Elite is the commuter’s dream. Compact. Sleek. Powerful. Built with a durable aluminum frame that’s perfect for navigating through tough city streets. 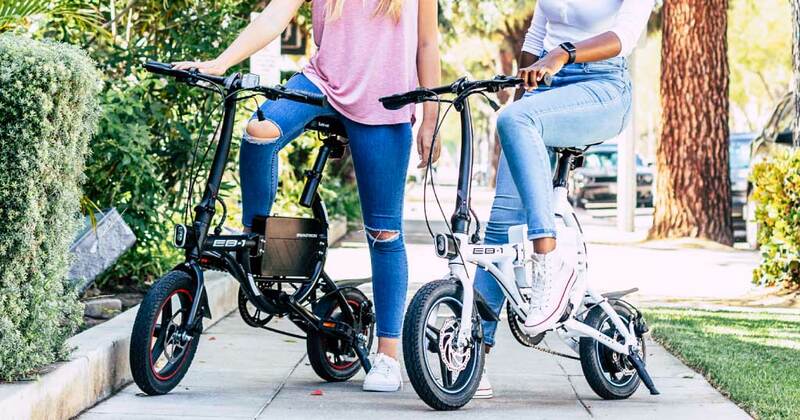 This foldable eBike rocks in-demand features and top specs, including an efficient 350-watt motor, extended mileage, and a removable 36-volt lithium-ion battery that recharges fully in less than 4 hours. Battery-powered bicycles come in many forms, capable of handling much more than just a daily commute or weekend adventure. Electric bikes can also be used to conquer the rougher terrains of the great outdoors. And that’s why we came out with the EB6 Bandit and EB8 Outlaw. The EB6 is a real fat-tire eBike built to let young riders experience the thrill and freedom of mountain biking. Like any true fat bike, the EB6 features four-inch air-filled tires for confident traction on a variety of loose terrain. Dirt, sand and snow — nothing will hold you back. Seven gears give you plenty of range for tackling a variety of terrain. And a Shimano freehub means you can keep coasting even after you stop pedaling. But the EB6 Bandit gives you power to go farther, hit the trails harder and experience powered mountain biking like never before. Fast. Silent. Efficient. 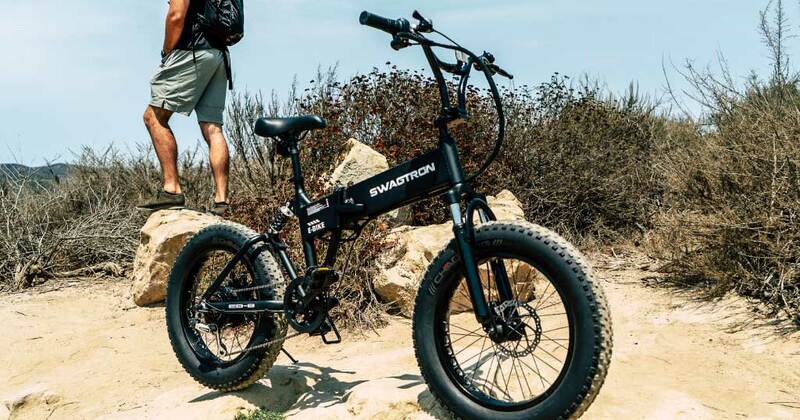 Everything you’d want in an all-terrain eBike that lets you Ride Beyond the beaten path. Its super-wide 20-inch wheels provide superior traction, grip and shock absorption that outclasses standard tires. Riders will be able to easily tackle loose and rough terrain like sand, dirt, gravel, mud and more. With the EB8 Outlaw, nothing will stay in your way. The EB8 Outlaw features seven Shimano gears with precise gear shifting at the push of a button, and smooth MF-TZ21 freehub for smooth sailing. The EB8 Outlaw — where exhilarating power and undeniable performance meet. High quality build. In-demand features. 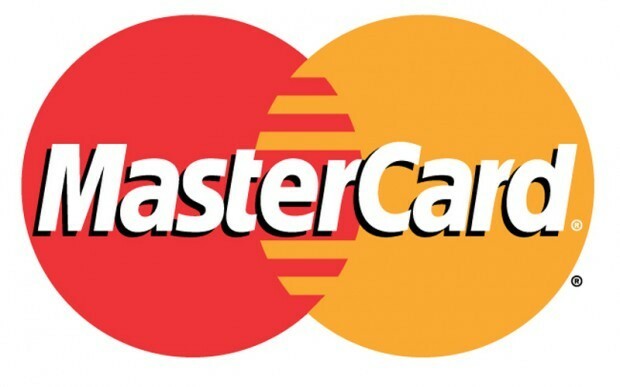 Competitive prices. These define the SWAGTRON® value. That’s reason enough to buy direct from Swagtron. 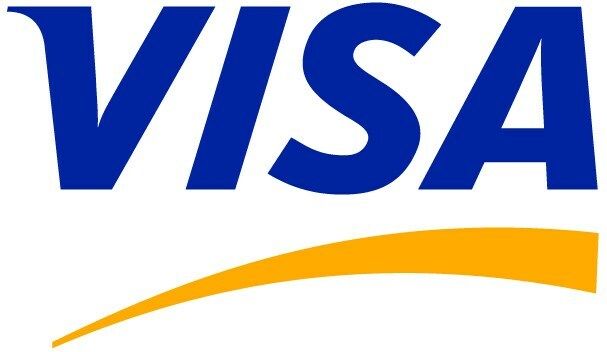 Free shipping on all orders shipped to the contiguous U.S. states. Easy-pay installment plans through Affirm. Gold-standard customer service team, fully staffed in the U.S.
Best-in-class 1-Year Limited Warranty on all new products. Extended holiday return policy: through January 31, 2019. Good Christmas gifts are coveted. They’re the gifts that last longer, used often. But great Christmas gifts are more than that. Great gifts become a part of your daily life, your everyday routine. They’re the gifts that you find yourself returning to, long after the initial allure has rubbed off. Why? Because great holiday gifts are essential. Need cool gift ideas for the holidays? Look no further than www.swagtron.com. We got you covered. 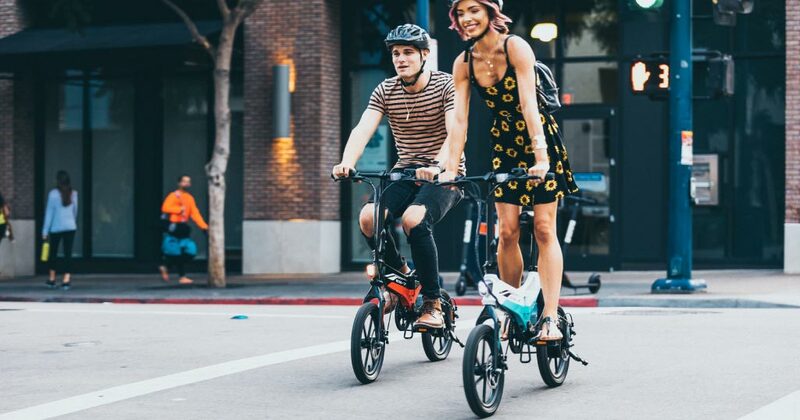 Whether you’re buying a pedal-free Swagcycle or an electric bike with multiple riding options, you’re going to have fun. That’s a given. 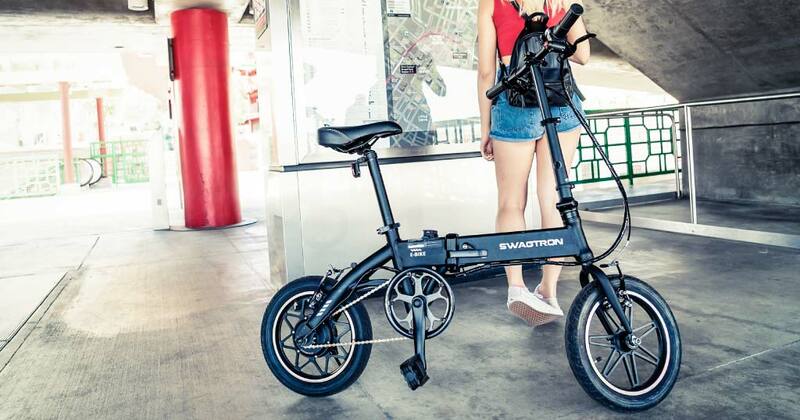 Riding a SWAGTRON eBike will be an exhilarating, exciting and empowering experience. But caution should always come first. Remember to only ride where permitted by law and never ride without protective gear. That means knee and elbow pads and an ASTM F1492-certified helmet. If you’re grabbing one of our eBikes for the holiday gift for you or a loved one, be sure to throw some protective gear in the mix. Need help deciding which electric bike is right for you? 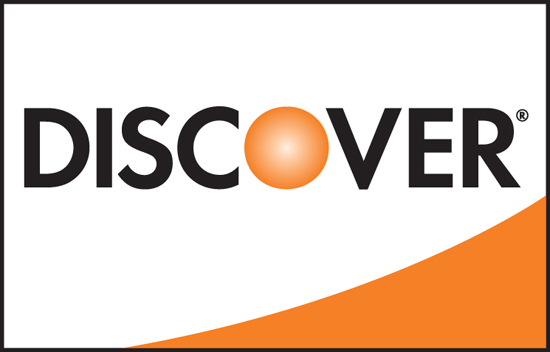 Check out our totally unbiased (no seriously!) E-Rideables Buyers Guide. 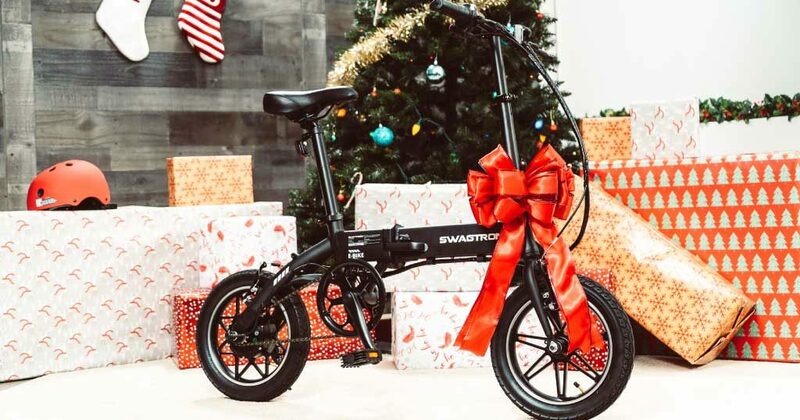 You’ll learn everything you need to know to find the perfect holiday eBike for you or your loved ones.